The Paint Stewardship Act of 2014 requires paint manufacturers to collect and reuse, recycle, or safely dispose of leftover paint. 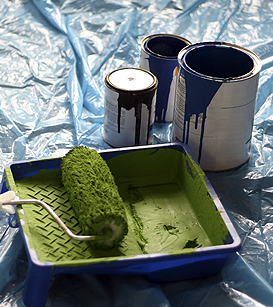 Manufacturers, or representative organizations of manufacturers, are required to register with DOEE, pay a registration fee, submit a paint recycling and management plan, and annually report on collection and recycling activities. A paint stewardship assessment will be added to the price of paint to cover the cost of recycling and responsible disposal of discarded paint. DOEE approved of PaintCare’s revised plan on August 1, 2016 and PaintCare launched its program on November 1, 2016. PaintCare establishes used paint collections through retail drop-off locations and one-day paint drop-off events. Please visit PaintCare’s District of Columbia webpage or call (855) 724-6809 to find the nearest paint drop-off location to you. Beginning November 1, 2016, all paint retailers must add the PaintCare Fee to the purchase price of paint sold in the District. More information on the fee can be found on PaintCare’s webpage. Producers and retailers may only sell architectural paint in the District that is registered with PaintCare. View PaintCare’s listed manufacturers and brands. DOEE will first assist manufacturers and retailers with achieving compliance through outreach and education. After the period of compliance assistance has ended, DOEE may pursue enforcement action, including fines and penalties. On October 14, 2016, DOEE published a Notice of Proposed Rulemaking for the Paint Stewardship Program Infractions. All persons desiring to comment on the proposed regulations may email comments to [email protected] by November 14, 2016 at 5pm. Please email [email protected] with questions related to implementation of PaintCare’s program.